Your Montreal food and bike tour begins near Atwater Market on the Lachine Canal. 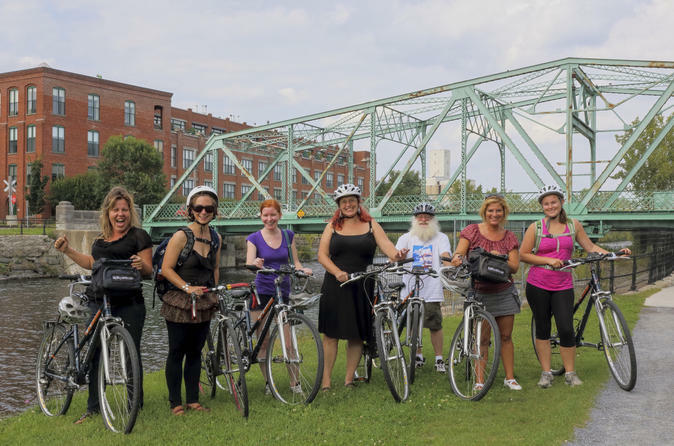 Meet your guide and group here to be outfitted with your bike, helmet, bike lock and pannier (a basket that attaches to your bike to hold your belongings). You’ll also receive water to keep you hydrated during your ride. Listen to a quick introduction about cycling safety, and hear fun facts about the street food movement in the US and Canada, as well as the history of food trucks in Montreal, where they were banned in 1947 and then re-instated in 2013. Then, take off on your 6-mile (9.5-km) journey, following your guide down the bike path that runs along the canal. Head north to Old Montreal, passing by St Patrick Square and then crossing the canal to reach the old city. Visit your first two food trucks in Old Montreal, and then continue to visit two more in Old Montreal’s business district. Pedal to the downtown business district to hit your last two trucks; the exact food trucks visited will vary each day depending on which local trucks are parked in each location. At each truck, in addition to eating, you’ll also chat with the chefs when they’re available and hear interesting stories from your guide about how each truck came to be from the hard work of their entrepreneurial, food-loving owners. Your tour ends back at the starting point, where you’ll receive a map of central Montreal so you can continue your culinary exploration of Montreal at your leisure! The menu changes day to day, but samples are typical of the examples listed below; all tours include two appetizers/snacks, two main dishes, three drinks and a dessert.